As a guy who appreciates a good shave, I did switch away from your standard Gillette or Schick multi-blade cartridges and ‘canned foam/gel’ method of shaving and went back to the method that many of our fathers and grandfathers used to use to remove facial hair – double-edge shaving. Now this bought a few nice benefits – a better shave, less irritation and bumps/ingrown hairs, and a much more relaxing and satisfying experience. When you can lather up in the morning with a nice soft badger brush and some quality shaving cream like one from Taylor of Old Bond Street or even the old Italian standby Proraso, it is always a great start to the day. Generally Gillette et. al do not want western markets shaving with Double edge blades, as they would prefer to sell us a 3-4-5 blade cartridge from anywhere from $3-$6 each. Since the invention of eBay, sellers from other markets can deliver 100 top quality double edge blades into western markets for the price of around $20-$30, making each blade worth around 30 cents. This makes shaving much cheaper, enjoyable and generally better. A whole swag of businesses have sprung up online selling all sorts of shaving related items, even new double-edge razors, brushes, blades, shaving soaps, creams, aftershaves. Even the old ‘cut-throat’ razors are making a comeback – generally better known as ‘Straight Razors’ – along with all the things needed to keep them sharp like sharpening stones & strops. A very good Australian based seller is MensBiz, with whom I have had good experiences with fast delivery, even if the prices are a bit higher than buying from overseas. Unfortunately with this new found popularity has meant that unscrupulous manufacturers in China who can produce a very low quality blade for about half of one cent will package them up to look like a higher quality, known brand blade. While the profits may not be very large on a per-unit basis, in volume it can turn into a very lucrative business. A seemingly normal looking tuck of Gillette double-edge blades. A closer look at the packs of blades. Note how the cardboard is peeing back from the bottom edge. The back side of the packaging. 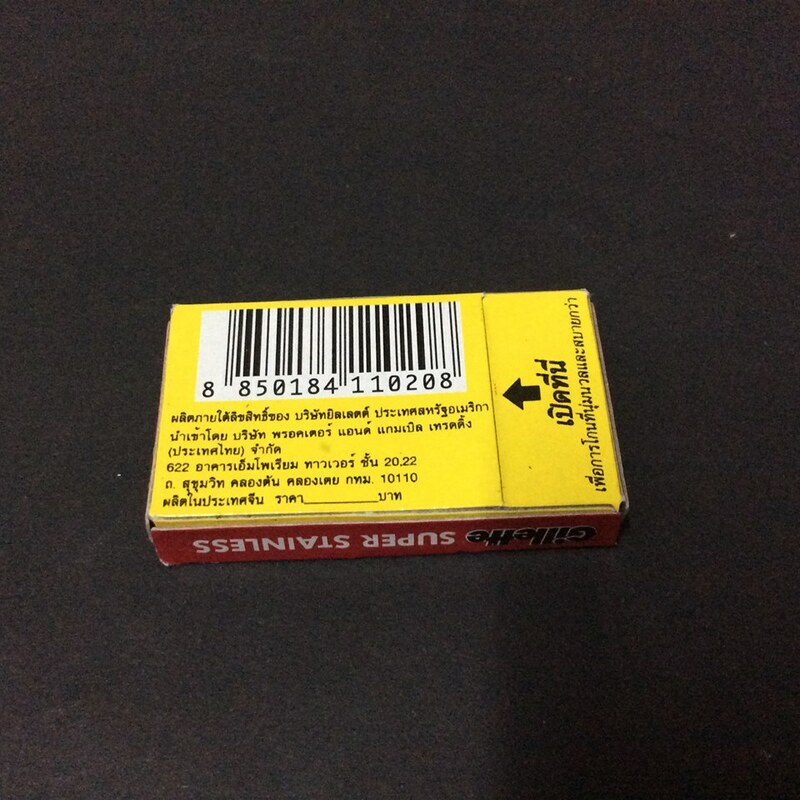 A big tell-tale sign of a fake is the quality of the box folds, and how it is not assembled properly. The printing is also not as crisp as it should be. As you can see, the cardboard has peeled back from the crease after being bent into shape, and the box is not glued nice and square. Oh dear. 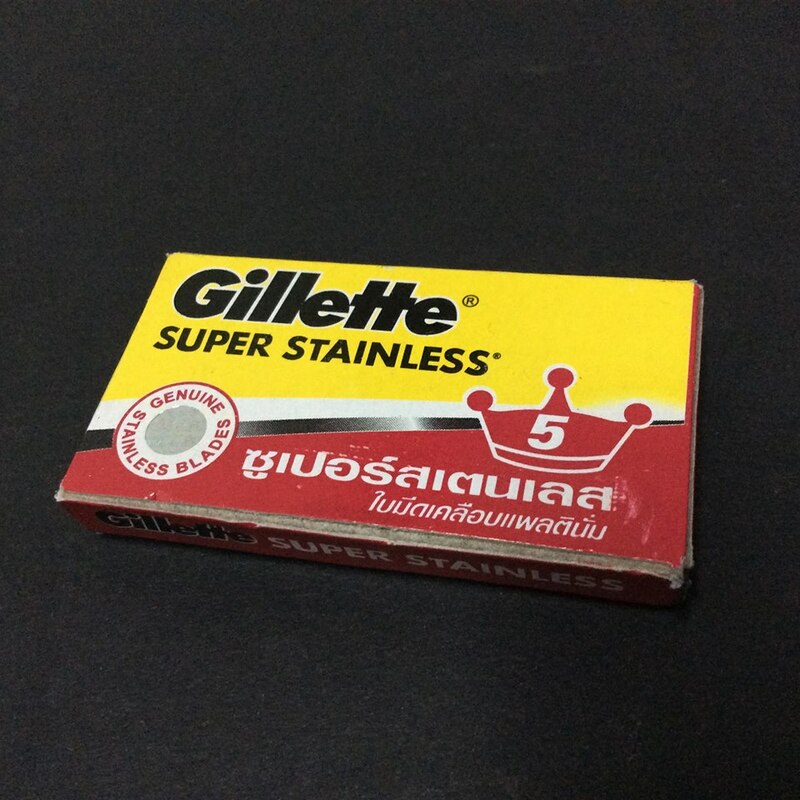 That is another decent yet clumsy effort to pass of cheap Chinese blades as a quality Gillette product. It seems that these low-quality blades were produced by a company in China called “RunWei Blade”, and those in the traditional shaving circles already know they are producing bad fakes of the Chinese Blue Blades that are usually made in the Gillette Joint Venture factory in Shanghai. Those “FakeBlues” seem to make their way to the West via eBay and DX, now it looks like they are also doing the same for these Thai Super Stainless. 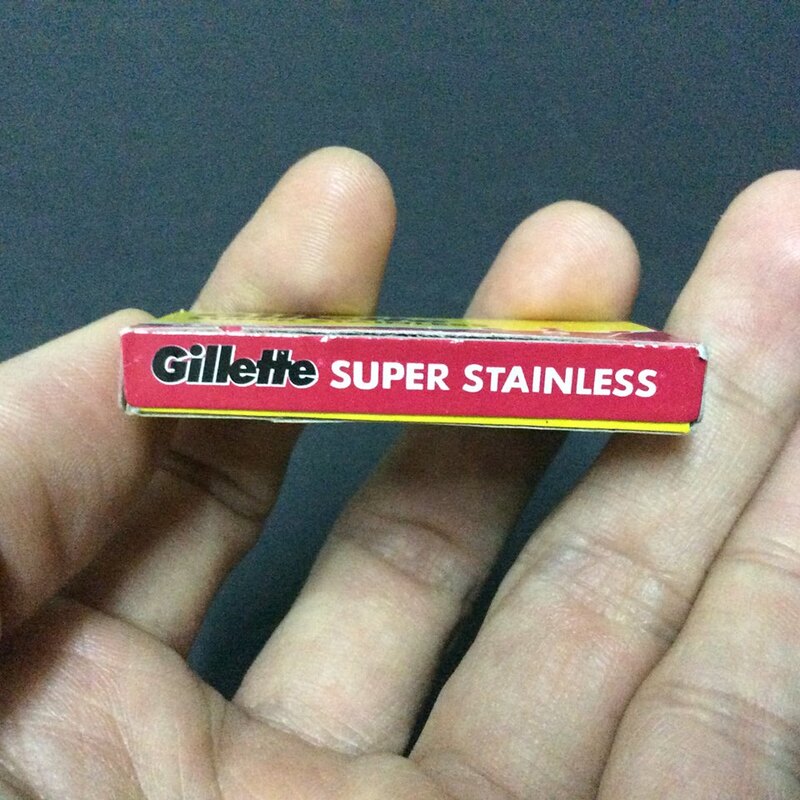 I am not even aware of these SuperStainless even being a real branding of Gillette Blades. If you look closely at the second photo, you will notice the cardboard cracking along the folds of the box. 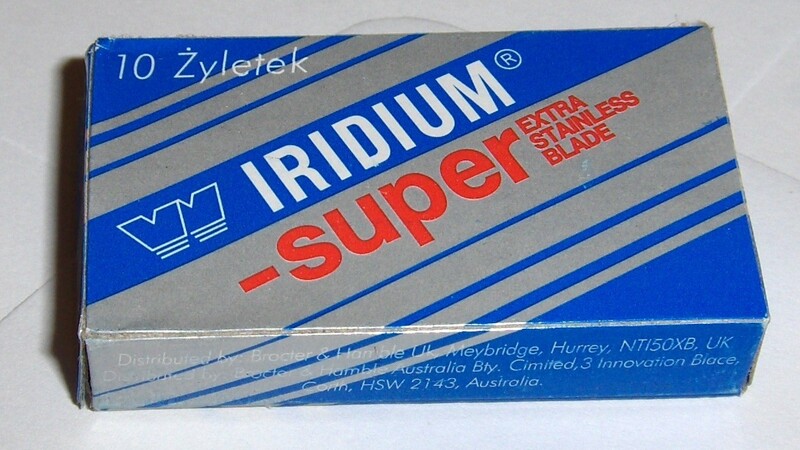 Those that have been around the wetshaving forums like Paste & Cut for a while will know that the counterfeit Gillette Rubie Platinum Plus suffered from the same issues on the box, as did the ‘Fakeidiums’ – the nickname for counterfeit Super Iridium blades. 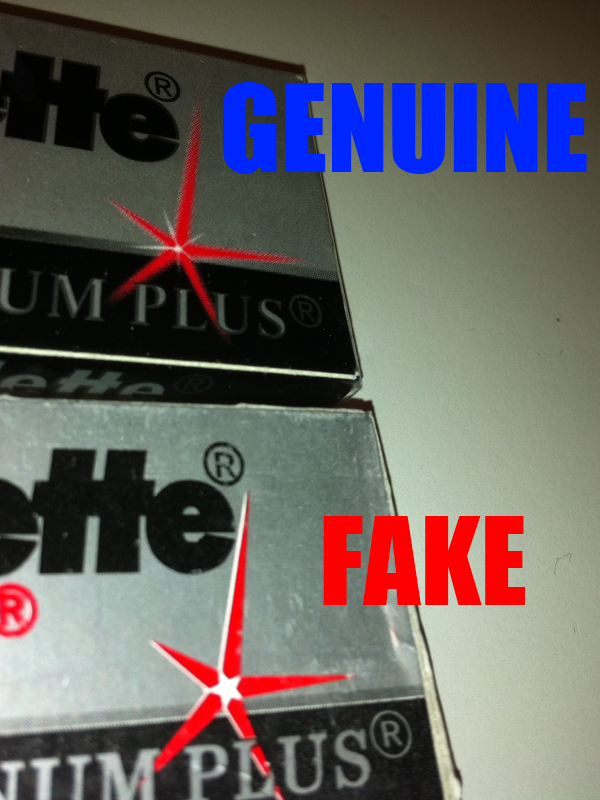 This shows the difference between counterfeit and real Gillette Rubie Platinum Plus boxes. A counterfeit pack of Super Iridiums. Note the cardboard on the corners has cracked and peeled. There are a number of sellers of these on eBay, I would steer clear of them all for ANY purchase. 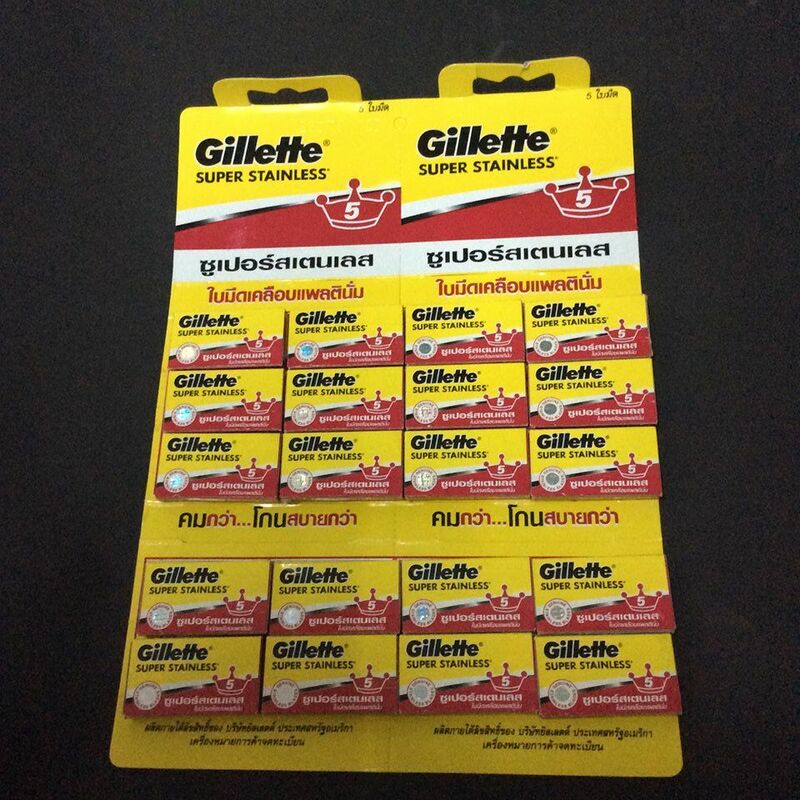 All originate from Thailand and are selling them at anything from USD$58 – USD$70 per 100 blades on a delivered basis. It is a shame but I am posting this information in the hope that nobody gets caught out by purchasing these blades. The pricing is crazily high, and even more so when you consider that great blades like PermaSharp Supers and Silver Blues are in plentiful supply and at much cheaper rates than what the asking price is on these. If you want to know more about trying out more traditional methods of shaving and some of the great products you can use, I would highly recommend Paste & Cut for those in Australia and New Zealand. The community there is small but active and is more than happy to share their knowledge with newcomers.